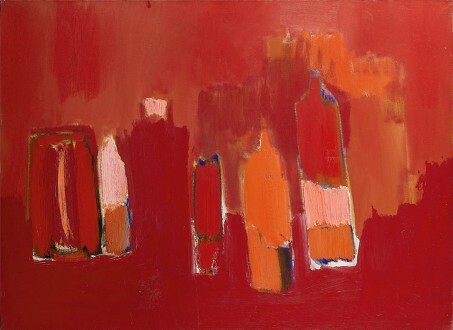 In a letter to Douglas Cooper in January 1955, Nicolas de Staël wrote: “True painting, always attempts to include all aspects, the impossible addition of the present, past and future.” A sentence laden with hidden meaning which recalls the sterile debate – abstraction/figuration – at the centre of which the artist had often found himself, lucid about the risk of committing himself to a preferred path which would have deflected his dialectic governed by a state of keen awareness when he was painting, although open to unforeseen reactions under the pressure of chance. Convinced that there were only two valid things in art: 1) the dazzling speed of authority, and 2) the dazzling speed of hesitation, he explained to Pierre Lecuire: “One never paints what one sees or thinks one sees, one paints with a thousand vibrations the blow received, or to be received, and how can one cry without anger a head in one hand and a platform in the other” (letter of 3 December 1949, Lettres de Nicolas de Staël à Pierre Lecuire 1949–1955, Pierre Lecuire, Paris, 1966). Born in tsarist Russia, de Staël spent his early childhood in the severe but magnificent Peter and Paul Fortress of which his father, the Baron Vladimir Ivanovitch de Staël-Holstein (a Baltic military family, related to the family of the husband of the famous woman of letters) was the Vice Governor. His mother was from a wealthy Slav family. A pianist and also passionate about painting, she encouraged her son to draw and paint. At the age of two he was appointed a page at the imperial court. When in 1917 the Revolution broke out, the de Staël family fled to their property in Estonia, before emigrating to Poland in 1919. In 1921 de Staël’s father died, followed by his mother the succeeding year. Nicolas and his two sisters were placed in the care of Mr and Mrs Fricero, a Russian couple living in Brussels who were to become Nicolas’s foster parents. From 1922 to 1930 he attended the Jesuit Collège Saint-Michel in Brussels before, in 1931, going on to study the classics at the Collège Cardinal-Mercier in Braine-l’Alleud. He was top of the class in French, developed a passion for Greek tragedies and won cups for fencing, tennis and swimming. From 1933 to 1934 he studied classical drawing at the Académie Royale des Beaux-Arts in Brussels in a class given by Mr Van Haelen, as well as painting. He obtained first prize in the competitive examination with Un bateau-fantôme sur une mer démontée. He attended architecture and decoration classes at the Académie Saint-Gilles with Charles Malcause and Georges de Vlamynck. During a visit to Holland, de Staël admired the work of Rembrandt and Vermeer, and also painted his first watercolours. On his return to Brussels he decorated a bedroom for the royal children at the Palais de Laeken. A stay in France permitted him to discover Provence, and in Paris he was impressed by the works of Cézanne, Matisse, Braque and Soutine. His earnings as a decorator’s assistant enabled him to make a bicycle tour of Spain from June to October 1934, with his friend Edmond d’Hooghvorst. He was struck by the work of El Greco and made a large number of drawings. In 1935 he was back in Brussels, where he rented a studio and worked for the exhibition of 1935. In February 1936 he exhibited his watercolours and icons at the Galerie Dietrich, and in June left for Morocco with Alain Haustrate, with whom he had exhibited. Exhilarated by the light, he remained in Morocco for almost a year, living among the local inhabitants and drawing and painting at Fes, Rabat, Casablanca, Khenitra and Marrakech (most of these works were destroyed). In August 1937, while still in Morocco, he met the artist Jeannine Guillou, who was at that time married to the Polish artist Olek Teslar. The couple were touring Morocco on the back of a donkey with their small son Antek (Antoine Tudal). In March 1935 Jeannine Guillou exhibited at Fes with her cousin Deyrolle. By the time Deyrolle rejoined her two years later, she had left her husband and was living with Nicolas de Staël. Jeannine and Nicolas travelled to Algeria together, working and talking ceaselessly. In January 1938 they visited Italy (Naples, Pompeii, Capri, etc. ), where de Staël copied Titian, Bellini and Mantegna… before returning to France when their money ran out. Nicolas spend three weeks working in Fernand Léger’s studio, but as they now no longer had any money at all, the couple were obliged to live for a while with Jeannine’s parents in Concarneau, where they met Deyrolle, whose talk placed de Staël on the path to abstraction. In September they once more returned to Paris, where they occupied a studio at number 124 rue du Cherche-Midi. De Staël made copies of works by Chardin and Delacroix at the Louvre. In 1939, to earn a little money, he carried out the wall painting at the Pavillon de l’Eau at the Exposition Internationale de Liège for Lucien Fontanarosa. When the Second World War broke out, de Staël joined the French Foreign Legion, which welcomed foreigners for the duration of the conflict, but he was not called up until January 1940, at Sidi-Bel-Abbès. Demobilised in September at Sousse, he rejoined Jeannine in Nice. They socialised with Magnelli at Grasse, Sonia Delaunay, Jean Arp, Le Corbusier, Goetz and Christine Boumeester, whose work got him thinking again about the nature of his painting. Encouraged by these artists at the centre of the abstract movement, he discovered his true personality (still lives, portraits of Jeannine): “I have tried to attain a freer form of expression.” In September 1943 the family (young Antek had been joined by a girl, Anne, born in 1942) arrived in Paris, and assisted by their friendship with Jeanne Bucher, moved into Pierre Chareau’s hôtel particulier at number 54, rue Nollet (de Staël had got to know its owner, who was now living in America, in 1939). They began to see Deyrolle again, once more living in Paris. The two men influenced each other, and we can see certain similarities in their work, particularly in the pastels. De Staël worked relentlessly, painting large canvases. He was encouraged by Jeanne Bucher who, in February 1944, showed his work for the first time alongside that of Domela and Kandinsky. This brief relationship with the great master was to be a considerable encouragement for de Staël. His paintings of this period show geometrical arrangements broken by strong rhythms suggested to him by real objects: hammers, pincers, trees, roots, hand presses or butcher’s meat. The use of a knife enabled him to flatten the thick texture, giving his violent compositions with their bright colours an expressive tension. He made friends with Georges Braque (who provided a lithograph to illustrate a book of poems by his stepson Antoine Tudal), and with Lanskoy, who helped him, directing him towards a more lyrical and colourful style of painting. With Lanskoy, whom he referred to as ‘le superbe coquelicot’, he shared a taste for texture. He was also encouraged by Jean Bauret, to whom he had been introduced by Lanskoy and whose friendship and critical eye were to accompany the artist for the remainder of his career. In the spring of 1944 two young dealers, Pierre Panier and Noëlle Alexandre, hid an active resistance network that had as its front their gallery in the place Dauphine, the Galerie L’Esquisse, taking the risk of organising a group exhibition Peintures abstraites, which included Domela, Kandinsky, Magnelli and de Staël. The following month, the Galerie L’Esquisse gave the artist his first solo exhibition. Jeanne Bucher followed in 1945, organising a solo exhibition of de Staëls’ work in her gallery in the boulevard du Montparnasse. In May he was invited to participate in the first Salon de Mai. For a few months he worked in a maid’s room in rue Campagne-Première, before moving into a studio at number 83, boulevard du Montparnasse, where he lived until 1947. This was a period of extreme financial difficulty for the artist. De Staël, who lived with his family in a state of utter destitution (Jeannine Guillou, already ill, was to die in February 1946), drew regenerating strength from despair haunted by hunger. A number of art lovers were interested however in his work. He met Pierre Lecuire and Jean Adrian, who introduced him to Georges Limbour. His friendship with Braque meant a great deal to him, providing him with spiritual nourishment. He regularly visited the older artist in his studio in rue du Douanier near Parc Montsouris, and the two men would talk for hours. In May 1946 he married Françoise Chapouton. He was appointed to the Committee of the Salon de Mai, the only ‘abstract’ member among the non-figurative artists with their lyrical and surrealist influence. Before long, however, he resigned from the Committee, although he continued to show at the Salon in 1947 and 1949, and also from 1950 to 1955. In October 1946 he signed a contract with Louis Carré (through the intermediary of Louis Clayeux, whom he had known since 1944 and who introduced him to the collectors Dutilleul and Masurel), and Jacques Dubourg, a former colleague of Georges Petit, began to follow his work upon the advice of Lanskoy. Dubourg first bought de Staël’s work in 1947, and championed him until the end of his life. He worked on fabric projects (like Poliakoff and Geneviève Asse) for the Lys de Jean Bauret workshops. In January 1947 de Staël moved into a large studio in rue Gauguet, near Braque’s studio. He made friends with a neighbour, Théodore Schempp, an American dealer who, in 1951, held a major exhibition of de Staël’s work in his New York gallery. Now 32 years old, de Staël had found his path after many years of research, questioning and an uncertainty that was never to leave him. He realised that the question of space was central to the ‘new’ style of painting, and more specifically the question of space and colour, a conviction which he shared with other artists. Taking as his starting point the radical upheavals introduced by cubism and Matisse, and that were to be developed by Kandinsky, Mondrian and Magnelli, de Staël embarked on his own reflection at a period when, with the war over, everything seemed possible. The aesthetic battles and discussions raged, with critics proclaiming their allegiance to one side or another. To simplify the situation, paintings in which no known object could be identified were referred to as ‘abstract’. This expression was itself subdivided into different groups – informal, tachist and lyrical – and opposed to the no-less ambiguous expression of non-figurative art. As for de Staël, he always denied being an abstract artist, recalling that behind the works he had executed between 1943 and 1947 there had always been a formal and rhythmic experience, because “it disturbed him to paint a likeness”. Pierre Courthion had fully understood this when he wrote in his preface of 1948: “De Staël does not attempt to represent any particular object, on the contrary he presents an organic whole which avoids description and the picturesque; it remains removed from critics’ painting.” The geometrical networks whose thick impasto came to life beneath frenzied lines became gradually freer. An inner light seemed to rise up, softening the hieratic character of the angular rhythms that became violently entangled in the thick nervous texture transformed by pure colour. 1948 appears to have been a happier year. De Staël acquired French citizenship, and two children were born. He exhibited in Montevideo with a catalogue introduction by Pierre Courthion. Pierre Lecuire wrote L’art qui vient à l’avant. Nevertheless, beyond a narrow circle, de Staël’s lyrical abstraction continued to disconcert. Roger Van Gindertaël wrote with foresight: “I do not think that I am too rash in discovering in the work of Nicolas de Staël the most important event in present day art since Picasso” (Le Journal des poètes, Brussels, May 1948). In 1949 he made a short visit to Amsterdam, The Haig and Brussels, revisiting museums and seeing the North Sea. In 1950 the French state made its first acquisition of de Staël’s work for the Musée National d’Art Moderne in Paris. In June an exhibition of 12 of his paintings was held at Jacques Dubourg’s gallery. It met with little public success, although there were texts by André Chastel and Bernard Dorival Tal Coat, Singier, N. Staël in La Table Ronde, July 1950, Georges Duthuit, Charles Estienne, Patrick Waldberg, Roger Van Gindertaël, René de Solier Germaine Richier, de Staël, Bazaine, Chagall in Cahiers de la Pléiade spring 1950. That summer he visited Braque at Varengeville, where he went fairly often, also making a short trip to London to stay with Denys Sutton, who had been a friend since 1948. At the end of that year he met Suzanne Tézenas, whose salon, the birthplace of Domaine Musical, was frequented by musicians, poets and writers. In the following years, de Staël would meet there Messiaen, Boulez, Stravinsky, Dora Maar and Jean Paulhan. Early in 1951 a long friendship commenced with René Char, which was to lead to the completion of a book of Poèmes illustrated by de Staël. The wood engravings were shown in December by Jacques Dubourg on a tree trunk sawn lengthwise. The book was well received by critics when it appeared in February 1952. In spring 1951 Jacques Dubourg held an exhibition of de Staël’s drawings. De Staël stayed for the second time at Grignan. In 1952 a major exhibition was held in London at the Matthiesen Gallery, an exhibition which met with considerable success with the public, although the critics expressed their incomprehension of the 7 canvases out of the total of 26 exhibited, which heralded a return towards reality. There was a catalogue preface by Denys Sutton. Between 1948 and 1951 de Staël attempted to express his feeling of space and light by creating successive layers of coloured texture with strange enamel reflections. From 1952 onwards his vision of the world, enriched by his past experiences and based on considerable formal discipline as well as a perfect understanding of the relationships between colours, became influenced by the outdoor painting he practised at the time. In the spring of 1952 he painted from nature at Jean Bauret at Mantes, Chevreuse and Gentilly. He compared painting with the outside world, and submitted his paintings to daylight, something that he had never ceased to do. “He always used a putty knife. I advised him to use a trowel which is a large palette knife. His glazier’s knife created ‘biscuits’, I tried to get him to go from ‘biscuits’ to moons, from moons to barges, from barges to bottles, and so on… and he began to introduce pictorial forms based on nature… The passage from the abstract ‘biscuit’ to the concrete ‘moon’ is of importance,” wrote Jean Bauret (Catalogue Exposition de Staël, Paris, 1956). He who made fun of the “abstraction gang” did not betray – as some accused him of doing – his undertakings, but sought through non-figurative forms to generate a poetic transposition of reality. De Staël wrote in March 1950: “I do not ‘objectify’ anything that I see. I do not paint before seeing. I am not looking for anything other than painting ‘visible’ by everyone.” He wanted to be able to paint landscapes, the roofs of Paris, the sky at Honfleur, bottles, flowers and apples. This was the case for Une nuit au Parc des Princes – shown at the Salon de Mai in 1952 not far from Matisse, who showed his La Tristesse du roi and the paintings inspired by the football match between France and Sweden, which he attended on 26 March 1952. In June, he was in Bormes where, dazzled by the light, he spent his days on the beach at Le Lavandou painting brightly coloured paintings. In September he visited La Ciotat, where he was delighted by the life of the port and shipyards. In the autumn he went to Aubusson to supervise the manufacture of his tapestries at Picaud’s workshop. At the end of the year there were ballet projects with René Char and subsequently with Pierre Lecuire and Stravinsky, which however came to nothing. In 1952 Témoignages pour l’art abstrait appeared (Art d’aujourd’hui, Paris) by Léon Degand, with the artist interviewed by Julien Alvard and Roger Van Gindertaël. 1953 began with a rapid journey to Italy (Florence, Ravenna under the snow, Venice and Milan) with his wife and Pierre Lecuire, before flying to New York in March for his exhibition at the Knoedler Gallery. Nicolas de Staël himself wrote the short text for the catalogue: “All my life I have needed to think about painting, to look at paintings, to make paintings to help myself live, to free myself from all the sensations, all the anxieties from which I have never found any other release than painting. Today I am showing a body of work to which I am very attached in a way in which I have never been before, in all modesty.” Life in New York appalled him, but he managed to visit the museums, see the Barnes collection and spend four hours in front of Cézanne’s Baigneuses. On his return, exhausted by the trip, he made a lithograph for René Char’s Arrière-histoire du poème pulvérisé. He sent Les grandes bouteilles to the Salon de Mai. In June he received a visit from Paul Rosenberg, who requested exclusivity for America. His friend Pierre Lecuire wrote Voir Nicolas de Staël. He painted at Serre-Chevalier near Briançon. In July he stayed at Lagnes in the Vaucluse, followed in August by a visit to Italy and Sicily, where the temples and landscapes inspired him to paint simplified works with bright colours. In November he bought an old fortified house, ‘Le Castellet’, on the edge of the village of Ménerbes. He remained there until summer 1954, making regular excursions to Martigues outside Marseille. He had chosen the most austere and tragic region of Provence. In the immense white, sparsely furnished rooms, gleaming canvases accumulated, finished or in the process of completion, and painted with unusual energy. De Staël drew and painted incessantly, chiefly landscapes bathed in light and nudes. His technique began to evolve with lighter texture and brush work. Refusing to enclose himself in a permanent ‘solution’, he had to verify that his painting ‘worked’ in nature, and equally that nature was present in the painting. Each work was derived from his own visual experience. “I need to feel life in front of me and to capture it completely as it enters my eyes and skin,” he wrote. Intuitively, he had once again taken up the skyline to recreate space and achieve an osmosis between a plastic solution and his intense feelings. He met Douglas Cooper and visited the writer’s large cubist collection at the Château de Castille. In 1954 there was an exhibition of de Staël’s recent works at the Paul Rosenberg Gallery in New York. He regularly showed his paintings to Jean Bauret, whom he went to see at Erquinghem with his van full of paintings to “try and get a wide impression.” In April the Ballets Minutes by Pierre Lecuire was published with 20 etchings and the cover in colour. In June his fourth exhibition at the Galerie Dubourg was held, an event that generated a certain amount of controversy. Although André Chastel (Le Monde, 16 June), André Berne Joffroy and Roger Van Gindertaël understood and supported the change of direction in de Staël’s painting, L. Degand and Christian Zervos were not so certain. During that summer in Paris, he painted bridges, quays and Notre-Dame. He also made several trips to Gravelines on the North Sea coast and to Cannes to draw and paint. During 1955 he worked unremittingly at an exhibition planned for June at Jacques Dubourg’s gallery, and for a second exhibition to be held that summer in Antibes, making large figurative drawings in charcoal. He also worked on the illustrations for Pierre Lecuire’s Maximes. In March he made a brief visit to Paris to attend two concerts given by the Domaine Musical, with works performed by Schonberg and Webern. On his return he worked on L’orchestre, Le concert (Musée National d’Art Moderne, Paris). On 16 March he took his own life in Antibes. The exhibition at the Musée Grimaldi nevertheless took place as planned. In December 1955 Jean Grenier wrote Portrait posthume de Nicolas de Staël in L’Œil, and Christian Zervos wrote an essay for his Cahiers d’Art 30th year (pp. 265–276), among other tributes. In 1955 and 1956 a travelling exhibition was organised by the American Federation of Arts (catalogue, with a text by Théodore Schempp). Major exhibitions were held abroad from 1956 onwards. For France, let us mention those of 1956 at the Musée National d’Art Moderne (catalogue, preface by Jean Cassou), 1957 at the Galerie Jacques Dubourg, 1958 at the Musée Réattu in Arles (catalogue with an introduction by Douglas Cooper), and at the Galerie Jeanne Bucher with 43 drawings and a preface by Roger Van Gindertaël, and the Galerie Jacques Dubourg, collages with a preface by Roger Van Gindertaël, in 1965 at the Galerie de Messine in Paris, lithographs and prints with a text by Antoine Tudal. Nicolas de Staël exhibited at the Salon d’Automne in 1944, 1946, 1951 and 1952. He was invited to participate in l’École de Paris at the Galerie Charpentier in 1954 and 1955. Among the many group exhibitions there were: 1947 Fransche Kunst van Bonnard tot Heden, Gemeente Museum, The Haig. 1948 works by Adam, Lanskoy, Braque, Laurens and de Staël, Couvent des Dominicains, Etiolles. 1949 Les grands courants de la peinture contemporaine, de Manet à nos jours Musée de Lyon; Contemporary Art: Great Britain, United States, France, Art Gallery of Toronto. 1950 Foreningen Fransk Kunst: Levende Farver, Udvalgte Malerei og Billedtoepper af Nulevende Fransk Kunstnere, Charlottenbourg Kunstakademie; Young Painters from U.S. and France, Sidney Janis Gallery, New York; Advancing France Art works by Bazaine, Estève, Hartung, Lanskoy, Lapicque and de Staël, preface by Charles Estienne, Louis Carré Gallery, New York, travelling exhibition, The Phillips Gallery, Washington: Modem Art to Live With, Louis Carré Gallery, New York; Französische Malerei und Plastik 1938–1948, text by Jacques Lassaigne, Berlin; Mostra Internazionale del Disegno Moderno, Bergamo. 1951 Modern French Masters, Louis Carré Gallery, New York. 1952 La Nouvelle École de Paris, Charles Estienne 1st group, Galerie de Babylone, Paris: Paintings by William Congden, Nicolas de Staël, The Phillips Gallery, Washington; Malerei in Paris Heute, Kunsthaus, Zurich; Young Painters: École de Paris, Royal Scottish Academy Galleries Edinburgh; Europe, The New Generation, Museum of Modern Art, New York (travelling exhibition, USA), 1953 The Classic Tradition in Contemporary Art, Walker Art Center, Minneapolis; 2nd São Paulo Biennial. 1954 Tendances actuelles de l’art français, Kursaal, Ostend; XXVIIth Venice Biennial. 1955 Art in the 20th Century, San Francisco Museum of Art; Peintres d’aujourd’hui France-Italie, Turin. Other major exhibitions have followed since (list in the catalogue of the Fondation Maeght, 1991). 1972 De Staël. Fondation Maeght, Saint-Paul. Catalogue, text by André Chastel: Nicolas de Staël: l’impatience et la jubilation. 1976 Nicolas de Staël. Galerie Nathan, Zurich. Catalogue text by Bernard Dorival. 1979 123 dessins de Nicolas de Staël. Galerie Jeanne Bucher. Catalogue text by Antoine Terrasse. 1981 Nicolas de Staël. Grand Palais, Paris and Tate Gallery, London. Catalogue texts by Pierre Granville and Denys Sutton. 1984 Nicolas de Staël, peintures et dessins, Musée de Grenoble. Catalogue text by Pierre Gaudibert. 1986 Nicolas de Staël Antibes. Musée Picasso, Antibes. Catalogue texts by Danièle Giraudy, Germain Viatte and Jean Leymarie. 1991 Rétrospective de l’œuvre peint. Fondation Maeght, Saint-Paul-de-Vence. Catalogue. Biography, bibliography. 1992 Staël. Priorité peinture. Galerie Daniel Malingue, Geneva. Catalogue. 1994 Nicolas de Staël, peintures et dessins. Hôtel de Ville de Paris. Catalogue. 1995 Nicolas de Staël. Fondation Gianadda, Martigny. Catalogue. 2003 Nicolas de Staël. Musée national d'Art Moderne, Centre Georges Pompidou, Paris. Catalogue texts by Jean-Paul Ameline, P. Boulez, A.Hiddleston, G. Maldonado, A.Malherbe, E.Rathbone, G.Viatte. 2014 Nicolas de Staël. Lumières du Nord. Lumières du Sud. Musée d'art moderne André Malraux, Le Havre. Catalogue. 2014 Staël, la figure à nu, 1951 - 1955. Musée Picasso, Antibes. Catalogue. Museums: Paris Musée National d’Art Moderne, Musée d’Art Moderne de la Ville de Paris – Antibes – Dijon (Donation Granville) – Grenoble – Lyons – Rennes – Colmar – Troyes – Montpellier – Basel – Bern – Boston – London – New York – Washington – Rotterdam – Zurich – Dusseldorf- Winterthur – Kyoto. A complete bibliography can be found in the catalogue to the Grand Palais exhibition, held in Paris in 1981. Antoine Tudal: Nicolas de Staël, Le Musée de Poche, G. Fall, Paris, 1958. Denys Sutton: Nicolas de Staël, G. Fall, 1959 New York, Grove Press 1960. Douglas Cooper and Roger Van Gindertaël: Nicolas de Staël, Galerie Beyeler, Basel, 1966. Jean-Pierre Jouffroy: La mesure de Nicolas de Staël, Ides et Calendes, Neuchâtel, 1981. Arno Mansar: Nicolas de Staël, La Manufacture, Pans, 1990. Catalogue raisonné of the paintings prepared by Jacques Dubourg and Françoise de Staël, presented by André Chastel, letters annotated by Germain Viatte. Le Temps, Paris 1968. Correspondence of Nicolas de Staël. Tokyo, Rocco Shupan, 1984.